Families and children are most welcome at all St James’s services and events. 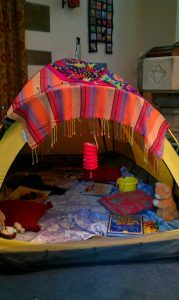 On most Sundays, at the back of the church you will find the Soul Space tent with books, toys, puzzles and colouring materials for children to use at any time. Our service on the first Sunday of each month (in school term time) is shorter and particularly geared towards children. And throughout the year we have special services and events that are very popular with youngsters. Look out for the Pet Service in October, the Christingle Service on Christmas Eve, the Pancake Supper on Shrove Tuesday and the popular Easter Egg Hunt on Easter Sunday. If you would like to receive updates on events and services of special interest to children, please send your email address to stjames@warpmail.net.